I finally got to try the Chef Driven DC food truck today, and I wasn't disappointed. 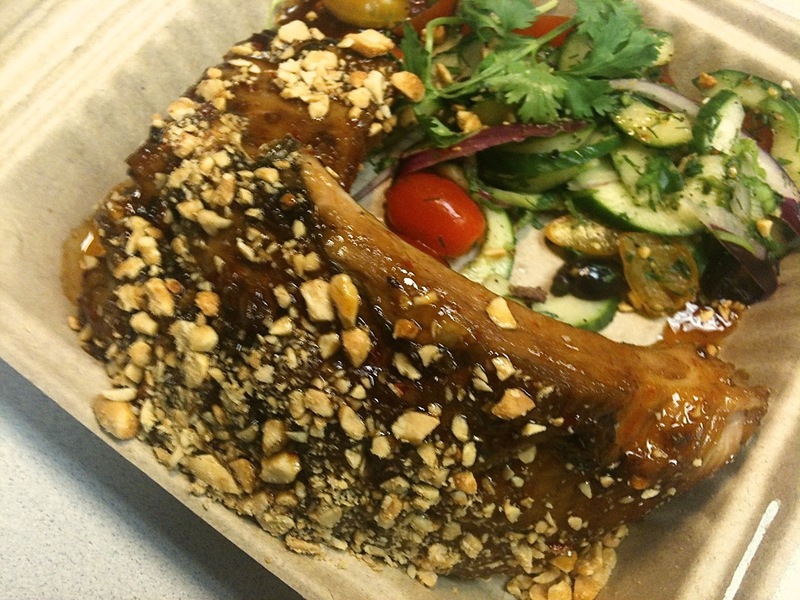 I had a delicious meal of Indonesian babyback ribs with a spicy-sweet soy sauce and chopped peanuts. The tender meat fell off the bone and the sauce had just the right balance of tangy, sweet and spicy. I also really liked the salad served with it: cucumbers, teardrop tomatoes, onion, olives, cilantro and dill with vinaigrette. Chef Driven is operated by Chef Jerry Trice, who has cooked in kitchens around the Washington region, including Red Sage, Vidalia and Yin Yankee in Annapolis and Bethesda, Md. I had a friendly chat with him and his assistant while my ribs were being prepared. The food is made to order, so you have to wait a little bit, but it was well worth it, and I appreciated how friendly they were. This was the truck's first stop in Gallery Place, which is close to my office. I hope they come back. If they do, I'll definitely be back as well. Chopped peanuts and barbecue sauce? Brilliant!